At Midwestern Seminary, we are beginning a new tradition: the faculty lecture. Formal academic presentations have a rich history in theological education and a rich history within the Southern Baptist Convention. After all, it was a faculty lecture that birthed Southern Baptist theological education in the first place. The newly minted professor, James P. Boyce, delivered his inaugural faculty address entitled, “Three Changes in Theological Institutions” at Furman University in 1856. Many Southern Baptist leaders, including Basil Manly Sr., Basil Manly Jr., Jesse Mercer, W.B. Johnson, and R.B.C. Howell had advocated for a theological institution in the South. It was Boyce whom God raised up as the ultimate catalyst, founding Southern Baptists’ first seminary in 1859. During his two-hour address, Boyce argued for three changes in theological education in order to produce an abundant ministry, a learned ministry, and an orthodox ministry. To achieve these ends, he argued a new seminary should make available programs of study to every student regardless of their previous level of education or even if they had no education at all. He also contended that the seminary should facilitate and promote the highest level of academic achievement. Then, to attain orthodoxy, every professor must subscribe to a confessional statement. More than a century later, and closer to home, Ralph Elliott stood before his Midwestern Seminary colleagues on September 8, 1960, and delivered his inaugural academic address. In a matter of months, he would publish The Message of Genesis and in so doing plunge both the institution and the denomination into a season of great upheaval and controversy. Yet, one did not have to wait until The Message of Genesis was published to sense what was to come. All you had to do was hear his address. You could clearly sense his appreciation for Julius Wellhausen, Karl Barth, Reinhold Niebuhr and others, as well as his desire to build an Old Testament department free from doctrinal fundamentalism and biblical literalism. The storm which would come to be known as the Elliott Controversy appeared in seed form that day for all who had ears to hear. Now at Midwestern Seminary, we celebrate an important occasion, not as auspicious as Boyce’s proved to be, and not as catastrophic (I trust) as Elliott’s, but significant none-the-less. In concert with my fifth anniversary as president of Midwestern Seminary, we are initiating a new tradition, the faculty address. In so doing, we are restating, reviewing, and reasserting our vision For the Church. On this campus five years ago, we set out on a new institutional course. Our stated goal was simple—to be the premier institution in North America training pastors, missionaries, and ministers to serve the local church. For the Church was born. Over the next few weeks, I want to reflect briefly on that vision, restate our commitment to it, review what gains God has given us, and look forward to the future. First, why be For the Church? We believe For the Church is a biblical mandate. We find our charter in the church’s charter in Matthew 16, where Jesus promised to build his church. We see that theme picked up and reiterated throughout the New Testament in places like Ephesians 4, where Christ promises to gift his church with pastors, ministers, and evangelists. We witness the theme in the book of Acts where we see the church birthed, growing, and metastasizing throughout the Mediterranean region and beyond. We move to the Epistles, and what do we see? We see letters to churches about how the church is to be governed, how the church is to function, what the church is to teach, and what Christians are to believe. Then, we come to the end of the Book, and what do we see? We see the book of Revelation—seven letters written to seven real churches—and we take in this great picture of Christ coming back ultimately and triumphantly for his church to rule and reign throughout the cosmos. We argue and believe that Midwestern Seminary’s right to exist, therefore, is directly tethered to our faithfulness to the local church. Moreover, I believe that any parachurch organization or ministry should be evaluated primarily based upon its faithfulness to serve, support, and strengthen the local church. Christ has promised to build his church, not his seminary. But as we are faithful to his church, doubtlessly He will build this seminary. Second, For the Church is a denominational expectation. 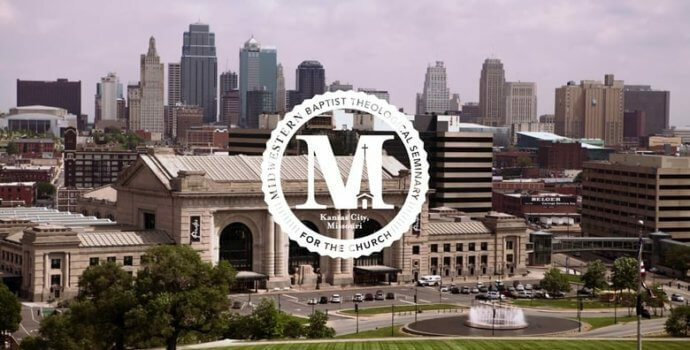 In 1957, the SBC founded Midwestern Seminary in Kansas City, its sixth and youngest seminary. Some were arguing for Chicago, others Jacksonville, still others Denver. Kansas City won out for three reasons. First, in Kansas City the seminary was positioned to penetrate the West and the North, which remains to this day needy for the gospel. Second, burgeoning enrollments at both Southern Seminary and Southwestern Seminary compelled the convention to say, “We need a seminary in Kansas City to alleviate the enrollment burden on those two schools.” Third, we were founded to serve the underserved churches in this region so they might have a sufficiently equipped clergy. In other words, there is a denominational expectation, explicitly set forth both in our founding documents and in our formal ministry assignment from the SBC, to serve the churches of the convention, especially the churches in our region. Third, For the Church has a historical imperative. Every time a seminary or divinity school has drifted from the church, disaster has always followed. One must simply read books like Glenn Miller’s Piety Profession or James Burtchaell’s The Dying of the Light to see the drift and what follows. Whether it is correlation or causation someone else can determine, but the facts are clear: When colleges, seminaries, or divinity schools wake up one day and are no longer under the oversight of a local church, disaster follows. There is a symbiotic relationship between the church and the seminary; they are to serve, strengthen, and support one another. It is the great, tragic irony that so many seminaries and Christian colleges, founded by churches to serve and support them, end up being the poisonous well that undermines those very churches. Fourth, we realize there is a present urgency for our vision. Our denomination, and the broader Evangelical world, is in the middle of a massive generational transition. A generation of ministers is retiring. The churches are asking, “From whence will a new generation come?” Midwestern Seminary must be ready to respond to that question every year going forward by supplying a new generation of pastors, missionaries, and ministers to serve our churches. Failure to do so will stymy the churches in our region. Thus, our mandate is clear: we exist For the Church. Next week, in Part II of this series, we will explore Midwestern Seminary’s commitment to this vision.